One reason we don't emotionally heal properly is that sometimes we don't take time to grieve loss. 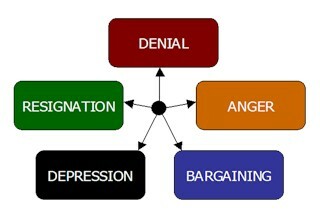 Many are familiar with the five stages of grief and if you aren't I highly recommend you learn about them. Grieving properly actually saves you time in healing because if you skip grieving you just backtrack later to go back and do it right in order to heal properly. You either grieve or become mentally ill - take your pick. A friend of mine recently shared on Twitter that she believes all churches should teach their people about grieving properly. It kind of made me happy to read that tweet because it's exactly what I'm teaching on the past week or two in my Sunday morning class. I'm feeling like I must be sharing something relevant and helpful to lots of people. I hate that so many have so much to grieve but I'm glad to share something that will eventually bring hope and healing if they just apply it. I tend to teach things as I'm going through them at times. I share what's burning down inside me. Right now it's forgiveness. Half the time I get up there and talk about it I'm just preaching to myself, convincing myself of why I need to keep going and actually go through with this all the way. Preaching to myself gets me through many a week. This week has been really hard, quite honestly, and it's only Wednesday. Just being honest that it's one of those weeks where I've wanted to say phooey on the whole forgiveness process and if it wasn't for the selfishness of caring about my own future and destiny maybe I would. Some days it's the selfishness of wanting to be forgiven myself, or not wanting to go to hell that pushes me to forgive. If for no other reason than the fact that I don't want the other person to come between me and Jesus...here I am. Still on this path. Not giving up. But still grieving some things I said goodbye to. In Jesus name, I'll get them all back. it's just a matter of time.